“No, we don’t get much passing trade!” agreed Lauren, laughing as she stepped out to meet us when we finally rolled up outside Ardanaseig Hotel. The sat nav had given up a mile or two previously, seemingly shrugging its shoulders and inviting us to take a compass and hike the last bit through the forest. I swear I heard its monotone drone “You’re on your own now, guys” as its little red arrow tracked forlornly across a featureless white map. 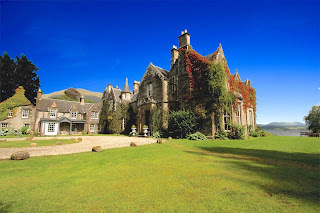 If there is a more remote hotel in the whole of mainland Scotland I have yet to hear of it. Before the sat nav finally abandoned us, it had taken us round in a near 20-mile circle. We’d driven west along the north shore of a long narrow arm of Loch Awe, technically the River Awe, dammed at the Pass of Brander. On its southern side, to our left, menacing screes tumbled sheer into the water while, to the north, rose the brooding bulk of the “hollow mountain”, Ben Cruachan – a mere 31st on the list of Munros (Scottish peaks over 3,000ft), yet taller than either Scafell Pike or Snowdon. Some miles on we had turned south before doubling back for ten miles behind the mountains, on a single-track road, which had eventually brought us to the long cul-de-sac leading only to Ardanaseig. And now, here we finally were, looking up at this early example of William Burn’s romantic Scottish Baronial architecture (fitting as we had just left Abbotsford, the home of Sir Walter Scott, which is probably the most celebrated such Gothic extravagance). 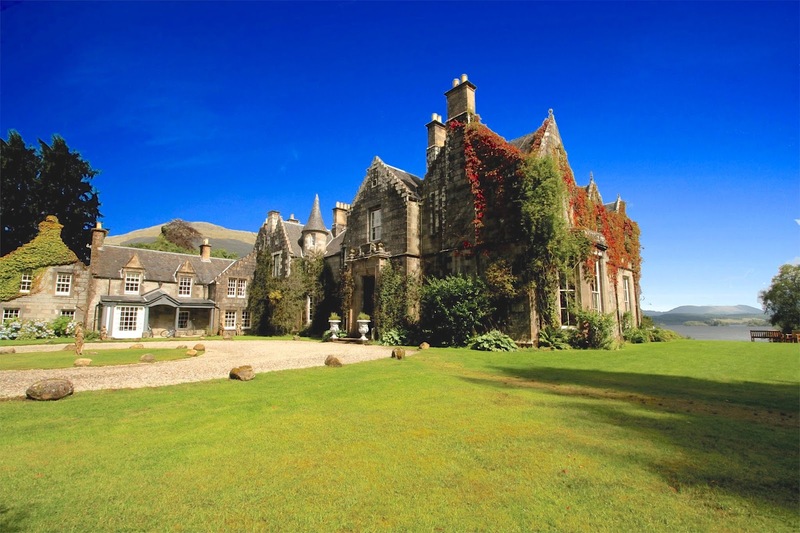 Location is all, and we found the hotel sitting comfortably in a natural bowl in the forest, commanding wide views across the still waters of the loch. The vista was, ahem, awesome. For once the hyperbole about a hotel (most of it, to be fair, written by people other than the hotel’s owner) looked to be, if anything, understated. We quickly began to appreciate just why the judges had been so impressed in two consecutive years. Getting the atmosphere right in a country house hotel is not necessarily all that easy – I recall a sniffy such venue in the Lake District once, at which jacket and tie at dinner was a requirement and I had brought neither. In the Lake District, land of the great outdoors, for goodness’ sake. And your country house guest list may range from young couples chasing romance to old chaps chasing a quiet day’s fishing, or shooting, so you’ve the challenge of keeping all these disparate interests happy. The staff at Ardanaiseig, some of them local, despite the apparent lack of population nearby, seemed to strike just the right balance: not overly formal, but equally, respectful and suitably indulgent. We quickly learned that, in addition to the guests – and a surprisingly large number were to join us at dinner having presumably similarly coaxed their sat navs to deliver them here – the hotel was lodging a very large personality. I refer to that of its owner of some 30 years, Bennie Gray. He’s loosely described in various places as an antique dealer, but really that doesn’t begin to do justice to the man. In fact he’s probably best known as the creator of Birmingham’s Custard Factory, where 500-plus artists enjoy the space to develop their creative industry in the sprawling Digbeth complex that was once where Bird’s custard was made. Prior to that, in the 70s, he brought creative entrepreneurs together under one roof at Gray’s Antiques, in London. Bennie seemed to be everywhere: his décor was at once exuberant and yet classy. Our own room – whose window perfectly framed an idyllic island-studded view across the loch – was very red; the one next door, very green. The dining room was similarly confident, with pride of place on its walls belonging to a rather unusual picture. Merely the largest and grandest of a collection that once hung on the walls of London night club, Tokyo Joe's, Bennie stumbled across them 30 years after that venue went bust. He believes it was originally a group portrait of councillors from Lancashire in the 1840s. Their faces, however, have been overpainted to represent, on the left, rock stars including Mick Jagger, Brian Ferry and George Harrsion. And to the right of the table, men of politics, including James Goldsmith. Although someone on TripAdvisor was a bit sniffy about the dado rails being the same colour as the walls, it would be a mistake to think for one moment that Bennie is not driven by high artistic ideals and, throughout the hotel, there are signs of its gentle ongoing restoration, such as a pair of marble columns in the drawing room that had been painted over with what Bennie refers to as a thick layer of "brown gunge". Also revealed a few years ago was a fine 300-year-old chimney breast, while – in the grounds – you’re apt to bump unexpectedly into statues and other artworks, often emerging, moss-covered, from their environment. So back to all those dinner guests I mentioned. One of the biggest challenges running a hotel kitchen in a hotel of this size, where guest numbers can fluctuate with the availability of fresh produce, is to deliver a fine dining experience from finite kitchen resources. We felt that chef Colin Cairns got the balance just about right in ensuring the menu varied enough each evening to satisfy longer staying guests. His locally sourced seafood and venison ticked all the right boxes, as did an imaginative wine list and a good collection of single malts and spirits, including the small-batch Highland gin, Caorunn. Not enough, though, for a strange and stringy man from London, who made a rather arcane complaint to Lauren across the bar about locally sourced ingredients and suggested London’s Borough Market might be better. My advice: stay in London, mate. His intervention, however, prompted my own conversation with Lauren, in which we got chatting about Bennie and she let slip that she believed he’d consulted a “wee wifey” before buying the place. I'm delighted that Bennie not only confirmed the story but wrote me 1,000 words of elegant prose describing the whole spiritaul endorsement and how the medium even helped him bid a lower sum than he had intended. The secret of staying at Ardanaseig is to slow down to its pace and to feel no guilt if all you want to do is read a book while watching the changing mood of the loch out of the corner of an eye. We took a wander through the lovely gardens one day, enjoying a picnic in the tiny walled cemetery that houses the estate’s ancestors. Feeling bolder, we took one of the hotel’s boats and headed towards the dramatic ruins of Kilchurn Castle at the head of Loch Awe. Now, many people know that Loch Ness is Scotland’s largest by volume of water, while Loch Lomond is its largest by area. Fewer can tell you that Loch Awe is its longest (25 miles) and third largest by area. That’s a lot of water – water that can move about a lot if the weather turns. Ten minutes out from shore and I began to feel uneasy: changing weather was coming in from our backs and I sensed we were running with an increasing swell. The boat felt very small and I suggested the white horses I could see ahead of us boded ill. Discretion, I find, is the better part of valour in these circumstances and I turned the wee boat gently back the way we had come and we gingerly headed back to more sheltered waters as waves broke repeatedly over the bows. Our return afforded time for a good nosey at the hotel’s Boatshed, a romantic hideaway with dramatic floor-to-ceiling windows overlooking the loch. For another visit perhaps. Back in the cosy security of afternoon tea in the sitting room I thought about those hotel judges who recently named Ardanaiseig Scotland’s Country House Hotel of the Year and, a year later, regional Best Luxury and Fine Dining Hotel. This, after all is the kind of place where attention to detail is such that they even tuck the belt back in on your dressing gown when they come to turn down the bed of an evening, close the shutters and leave mints on your pillow. Nearby: Inverary Castle, seat of the Dukes of Argyll; Ben Cruachan "hollow mountain" visitor centre.